In a show of solidarity, the Inter University Students’ Federation (IUSF) joined hands with the students’ union of the University of Jaffna to condemn the police killings of the two students in Jaffna. 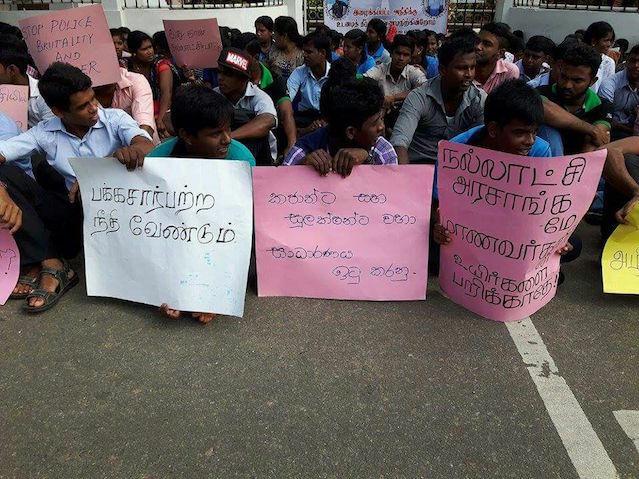 The students of the Jaffna University launched a protest against the shooting outside the Jaffa District Secretariat today. Meanwhile, several Tamil parties will launch a hartal in the North tomorrow against the killings, and demanding justice. TNA. TELO, PLOTE, EPRLF, TULK and ACMC will organise the hartal. The two victims were third year students at the Arts Faculty of the Jaffna University. They were returning home on a motorcycle, early in the morning last week after a party and when the police had ordered them to stop, they however had not stopped. The police had then opened fire which resulted in the two boys being killed. The postmortem report disclosed that the rider of the motorcycle had died from a bullet lodged in his body following the shooting. රම්ෆෝසාගේ පැමිණීම: ඇත්තෙන්ම සිදුවන්නේ කුමක් ද?